Long-time Lawrence University art department instructor Alice King Case died peacefully Monday, Dec. 16 at Appleton’s St. Elizabeth Hospital following a brief illness. She was 76. An accomplished artist who specialized in drawing, collage and abstract painting, Case joined the Lawrence art department in 1980 after teaching art classes in suburban Chicago for 21 years. 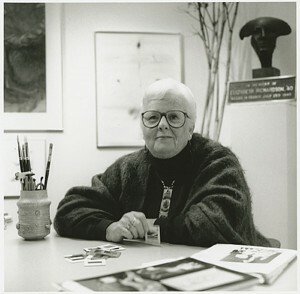 Through her initiative and insistence, Lawrence introduced computer-assisted art courses to the department curriculum in 1987. Born in Pittsburgh in 1937, Case lived a bit of a nomadic childhood, living in seven different states by the age of 16 before settling in the Chicago area, which she called home until she moved to Appleton in 1980. She was a two-time recipient of Artist-in-Residency awards to the Vermont Studio Center, one of the country’s leading creative communities for working artists. Her art was showcased in national juried and invitational exhibitions in more than 30 galleries across the country and several of her works were used as compact disc covers for Lawrence Conservatory ensemble recordings. Alice earned a bachelor’s degree in studio art at Coe College and pursued graduate studies at Northern Illinois University and Bennington College through the Massachusetts College of Art. She is survived by two daughters, Cathleen Robertson, Appleton, and Marianne Case, Milwaukee. A time of visitation will be held at Wichmann Funeral Home, 537 N. Superior St., Appleton, on Thursday, Dec. 19 from 5 p.m. until 8 p.m. with a prayer service to follow. The funeral liturgy will be held at 11 a.m. on Friday, Dec. 20 at St. Bernard Catholic Church, 1617 W. Pine St., Appleton. An additional time of visitation will be held at the church from 10 a.m. until the time of service.